In the vast majority of cases, hair loss in cats is the result of overgrooming, or excessive licking, often of one particular area. But why would a cat lick itself bald? It turns out that most of the time, overgrooming is due to pruritus (itchiness) although pain and stress are other possible causes. Often more than one factor will be at work, which can make it very difficult to find the initiating cause. Finding the reason behind your cat’s fur loss usually requires a process of elimination as we search for clues in your cat’s clinical history and run various diagnostic tests to rule out the most common causes one by one. 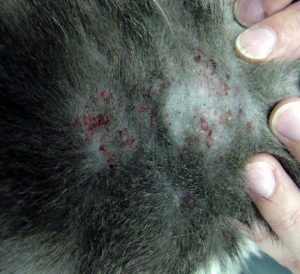 Flea allergy dermatitis (FAD) is the most common cause of itchy skin in cats and luckily is also the easiest to prevent! 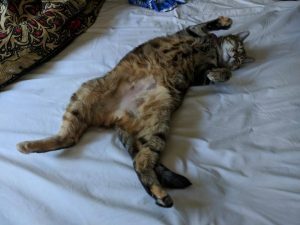 Cats that have FAD are allergic to flea saliva and so may become intensely pruritic with just one bite, while other cats that aren’t allergic can carry a large flea burden without apparently seeming to notice. This means that cats with FAD may not appear to have any fleas at all on inspection as they will be so irritated they will groom them all off. 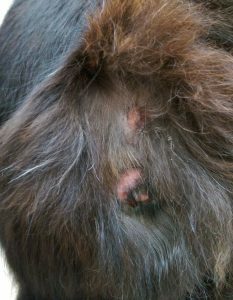 The only visible signs may be bald patches (alopecia) or secondary infection with multiple small scabs which can occur anywhere but are often found along the back or around the base of the tail. You may also notice an increase in vomiting or hairballs due to the excessive ingestion of fur. 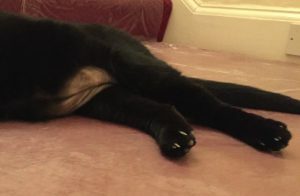 Long after the flea has bitten, the allergy persists and often steroids or even sometimes antibiotics are needed to settle the inflammation and infection. Therefore all cats with FAD, indoor or outdoor, should have good quality, safe flea treatment every 4 weeks to minimise the chance of developing an infestation. You may think that your cat is not at risk but flea eggs persist in the environment for a very long time so your cats could be picking these up from other visitors to your garden or you could be bringing them in on your clothes. At just 0.5mm x 0.3mm, flea eggs are extraordinarily tiny and therefore often missed. If the infestation is severe, we may also recommend a household spray to kill fleas at the larval stage and prevent them from growing into adult fleas. Of course fleas are not the only parasite that can cause itchy skin in cats. Other tiny creatures such as ear mites or harvest mites can be a cause of intense pruritus so we will also check for these when advising on flea treatment. We may swab the ears or even perform a ‘skin scraping’ to see if we can find any parasites living under the surface – essentially trawling through the outer layers of skin to see if we can catch any mites to be seen under the microscope back at the lab. This short, sparse hair coat is typical of a cat who is overgrooming – but why does he do it? Once on a good flea treatment regime, other causes of pruritus can be ruled out, such as a food allergy. Cats can be ‘allergic’ or intolerant to any number of food components, from specific proteins like chicken or beef to chemical additives or carbohydrate sources. If your cat is still itchy after ruling out fleas or other parasites, we may recommend a specific hypoallergenic diet and advise that you feed this, and only this, to your cat for 6-12 weeks. This can be difficult in a multicat household as there may be access to other cat foods. You therefore either need to separate the cats at feeding time, purchase a microchip cat feeding bowl, or if feeding ad-lib, all cats may have to be on the hypoallergenic diet for the period of the food trial. Not necessarily convenient, but a very important step along the pathway of finding out why your cat is overgrooming. If your cat doesn’t respond to either the flea treatment or a diet trial, there is a good chance they may suffer from a condition called atopy. Similar to many human allergy sufferers, this is where the cat might be allergic to any number of environmental triggers such as house dust mites or pollen, which can also be exacerbated by flea and food allergies. The allergens can be inhaled or ingested, or may contact the skin directly as in the case of laundry detergents and new carpeting. Diagnosis for atopy is difficult in cats and may consist of blood testing or hypoallergenic skin testing – neither of which are always conclusive. You could try removing potential allergens by, for example, switching to a sensitive, non-bio washing powder or perhaps limiting time outdoors to see if a change in environment might help. Keeping track of your cat’s level of itchiness over time can be very helpful as a seasonal pattern to symptoms can point towards atopy over something like a food allergy which might be present year-round. Because getting a definitive answer is difficult at best, atopy is often considered to be a ‘diagnosis of exclusion’ in that we usually only make this diagnosis once all of the other things above have been ruled out. Simba develops intermittent bald patches throughout the year – is it an allergy, stress, or both? The goal of any allergy treatment is to reduce the symptoms of the allergy, rather than cure it completely as this is often not possible. 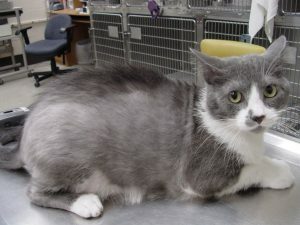 Treatment options include reducing the cat’s exposure to known allergens, immunotherapy (injecting tiny amounts of an allergen to gradually desensitise the body to it), and oral medications such as antihistamines, essential fatty acids and ultimately, if this is not sufficient, immunosuppressive medications such as lifelong steroid treatment. However long-term steroid medication comes with the risk of some serious side effects like diabetes, so the aim is to reach the lowest effective dose and only treat when necessary (i.e. during their allergy ‘season’, if they have one). Sometimes we may suspect that your cat is overgrooming not because they are itchy, but because they are painful. Cats that have joint pain may overgroom one particular foot or leg, or bladder pain from cystitis may result in a bald belly. Pain is often overlooked when searching for the underlying cause of fur loss but it is very important to rule this out before proceeding with more advanced treatments and diagnostic tests. A thorough physical examination and a trial of pain medication are probably the easiest ways to see if pain is to blame. Finally, cats that are stressed may use grooming as a sort of as a comforter to help relieve their anxiety. This misdirected behaviour is particularly common if the cat is feeling threatened, for instance living in a multicat household or being bullied by a neighbour’s cat. Boredom or frustration, perhaps with being kept indoors without adequate environmental enrichment can also contribute to overgrooming. Environmental factors such as building works, moving to a new home or even just a new piece of furniture can trigger excessive grooming, as can loud noises such as fireworks and high pitched noises such as ultrasonic pest repellents. If that wasn’t bad enough, all of the other factors listed above such as itchiness or pain can in themselves cause stress as well, further complicating the issue. Although anxiety can be the main cause of excessive grooming, it is perhaps more often a concurrent, complicating factor making the underlying problem seem even worse. As a result, it is essential that medical issues have been ruled out or managed before assuming that your cat is overgrooming due to stress. If anxiety is the diagnosis, get down on their level and try to figure out what might be stressing them out. Calming diffusers such as Feliway or Pet Remedy may help, as can supplements such as Zylkene and Calmex. Extra time spent playing with or brushing your cat and a little catnip every day can go a long way too! 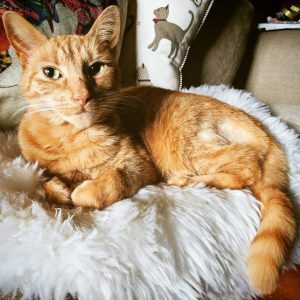 If you are struggling to deal with your cat’s anxiety on your own, you may want to consider a behavioural consultation to help uncover your cat’s trigger points for their stress, to advise you further on creating a harmonious home and, hopefully, a fully-furred feline! Of course, not all types of hair loss are abnormal. 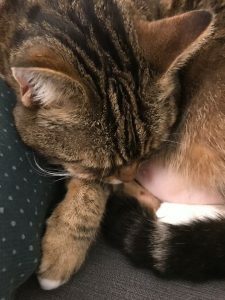 Fur loss due to hormone changes during pregnancy, hair that has been clipped for surgery that never regrows, or areas of fur loss over scars from significant injury are probably not a concern. Not to mention the whole Sphinx breed! But if your cat develops new bald patches, is seen to be grooming more than normal or even just has more hairballs than usual, it’s worth having them checked over by your vet. With the help of a good medical history, thorough physical examination and a few straightforward diagnostic tests and treatment trials, you should be able to get your cat’s hair coat, and happiness, back on track.